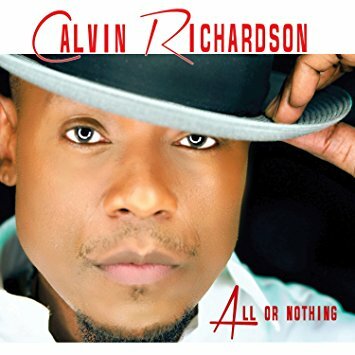 Though some of the musical world has yet to find him, Calvin Richardson is a singer worth discovering. Born and raised in Monroe, North Carolina (and a childhood friend of K-Ci and Jo Jo), Richardson grew up on gospel music and classic R&B and those roots shine forth brightly in his music. He made his solo debut in 1999 with Country Boy, helped by K-Ci, Chico DeBarge and Monifah. Unfortunately, it died a relatively quick death, despite showing the beginnings of a very talented artist. He also provided guest vocals on other albums, most notably Pieces of a Dream's Ahead to the Past. Then in 2004 Richardson signed with Hollywood Records and released 2:35. Featuring the fantastic single, "Keep On Pushin'," the disc was a sizeable &B hit and showed much of the R&B world that a legitimate, soulful Southern singer had arrived. Just as importantly, Richardson proved himself a solid songwriter, with a number of quality cuts on the album, including his version of "More Than A Woman," a song he had previously given as a hit single to Angie Stone. With the crumbling of Hollywood Records, Richardson again found himself without a record contract by 2006. He began working on his new album -- tentatively entitled C.R.I.B. -- and ultimately signed with Shanachie Records for his third release, which was retitled When Love Comes. It was released in May, 2008 to decent reviews and sales. One of the songs from that album, "There Goes My Baby," was later covered by Charlie Wilson and shot to #1, solidifying Richardson's songwriting creds. After years of comparisons to classic soul crooner Bobby Womack, Richardson chose to embrace the comparisons and record a tribute album to Womack. In early 2009 he began recording Facts of Life: The Soul of Bobby Womack for release on the Shanachie label. It earned him Grammy and SoulTracks Readers' Choice Awards nomination and was a hit. He followed it a year later with another album of strong original songs, America's Most Wanted, an excellent disc that won him SoulTracks' Male Vocalist of the Year. If you haven't listened to Calvin Richardson yet, do so soon.